Before I explain about some kind of Content Management System (CMS) we may have a little to know what is a Content Management System (CMS). Maybe for the webma sters, content management system or CMS is often abbreviated familiar, Content Management System (CMS) in general is a kind of tool to manage our website that we have cre ated a more friendly without the need to know the basics of web programming. 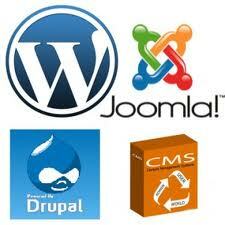 During this time many Content Management System (CMS) which is open source or free or paid. CMS has certainly paid more features and a better degree of stability of the CMS ope n source or free. Here are examples of some Content Management System (CMS) that is considered popular and widely used with the best quality of course. Content Management System (CMS) open source on this one is a very popular tool for this, use a combination of the language php and mysql database CMS makes t his much loved the webmaster. last released version 1.6.3 which was released on 18 April 2011. Content Management System (CMS) has a feature that is q uite complete, but sometimes even confusing, but for the ‘advance’ is very popular tool. Currently drupal de veloped by drupal community in all parts of the world, under the GPL license. Co ntent Management System (CMS) is open source or free to download. W ordPress is a Content Management System (CMS) open source the most widely used w orldwide. The use of language and the programming language pho mysql database to make it more user frienly CMS compared to other CMS. Unlike Worfpress, J oomla and Drupal. Expresion Engine is a Content Management System (CMS) pay. But also paid off with excellence in the field of security and safety. XOOPS CMS is a Content Management System (CMS) which is actually less friendly opensource denganpemula. XOOPS is also quite popular, but still below the WordPress and Joomla. But backed by managenen forum which is quite unr eliable. OsCommerce is a CMS Content Management System (CMS) based E-Commerce. OsCommerce is an e-commerce one of the most popular cms for having opensource license, and is also supported by public contributor who provide a variety of additional modules / plugins to complement e-commerce. Actually there a re many more examples of Content Management System (CMS) paid or free that I can not summarize here. current local CMS also has started a lot of progress. The u se Content Management System (CMS) is currently a popular trend dross, besides s implify managing a website in order to better and more efficient. This entry was posted in CMS, Hosting, Website and tagged CMS, Content, Joomla, MAnagement, System, Website, wordpress. Bookmark the permalink.